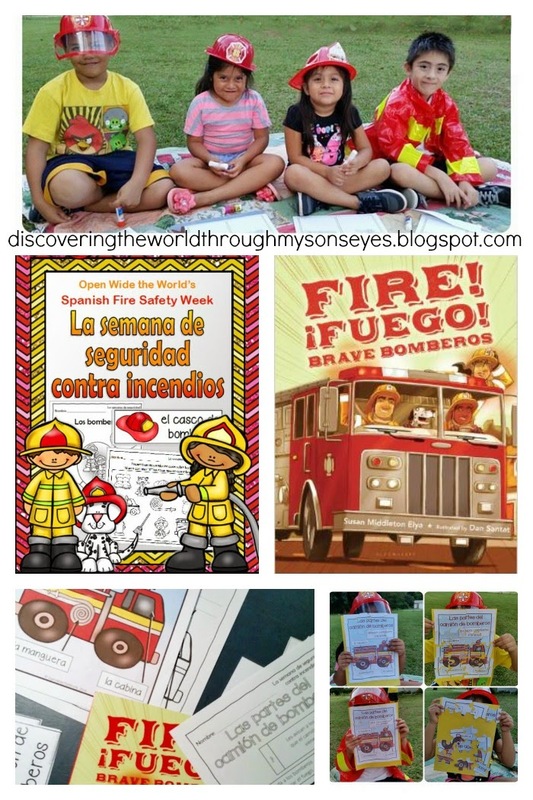 With Fire Prevention Week coming up next week schools across the country are in full swing on raising awareness on fire safety, and so are we in our Spanish homeschool! Disclosure: I received a complimentary copy of the “Spanish Fire Safety Week – la semana de seguridad contra incendios” for the purpose of reviewing it. I did not receive monetary compensation for this review. All opinions are my own. This post also contains an affiliate link (through Amazon). If you click on it, and make a purchase I will receive a small monetary compensation. Open Wide The World has some great tips on teaching fire safety, and the best part is that she has a packet in Spanish! ¡Si, señores en Español! This packet is ideal for Spanish, or dual language classrooms, and for Spanish homeschool as well. To supplement the packet we read the children’s book Fire! Fuego! Brave Bomberos by Susan Middleton Elya. The narrative of the story is both English, and Spanish; and it has a simple story line of the firemen’s bravery. It has vibrant pictures, and easy to read words that flow perfectly even when both languages are used in the same sentence. We also watched YouTube videos on fire safety in Spanish. Word wall cards x 16 I printed these to use like flash cards. I have little one read, and repeat each word. “In the fire station, I see…” writing & drawing sheet – perfect to start little one’s writing skills. Firefighter-themed, open-ended writing paper, with 2 line options – we used these to write the word walls and count how many syllables were on each word. Word search, with answer key – my child loves word searches! It helps develop a keen mind, and learn new vocabulary words. Sorting by properties cut-&-paste worksheet: hot vs. cold – I used this with little one’s Spanish play group, and they loved it! We also discussed other items that were cold, and hot. Parts of a fire truck poster to display via overhead projection – Since I don’t have an overhead projector. I printed it on card stock paper, and cut it into puzzle shapes. As we discussed the parts of a fire truck they were also putting together their puzzles. I also gave them a glue stick so they can glue it on a construction paper. The packet’s teaching duration is a week. I started the packet with my child at home, and used some with the Spanish play group. I also brought to the play group some fireman hats, and a fireman coat. Dressing up as firemen as we discussed what to do during a fire (reminder bookmarks to color from the packet) was definitely the most fun part for them. What I enjoyed the most about this packet is that the activities can be done by the youngest (PreK) to the oldest children (1st grade). It encourages them to think of the dangers of hot vs. cold, and creates an awareness of fire hazards, and learn new vocabulary words. Now that we learned what to do during a fire, and learned about fire safety next up is to make a fire safety plan for our home. In the meantime, check out All Done Monkey’s fire safety for kids post, and her fire safety plan.